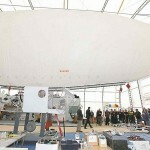 Solar-power system to run hangar may one day produce hydrogen. There are no cargo airships flying into northern Manitoba these days. Indeed, there are no cargo airships of any kind currently flying here. But there is a research entity and a for-profit company called Buoyant Aircraft Systems International (BASI) that is developing airship technologies. 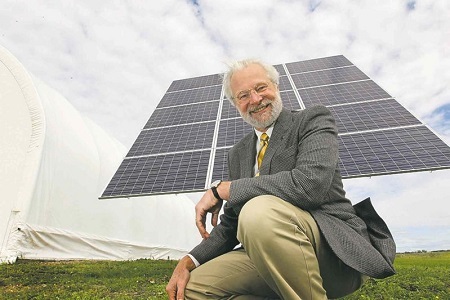 Barry Prentice crouches next to a new solar-power system installed at the BASI hangar, which currently provides heat and light for the operation. Both are the brainchild of Barry Prentice, the University of Manitoba logistics and transportation expert, whose passion to see the development of massive airships that can haul tons of cargo to the Canadian North at very low cost with little environmental impact is undaunted, even though many believe it’s futile. There are countless challenges in establishing a system for such a form of transport, including the high cost of developing the massive airships and establishing a basic infrastructure to manage them. Not the least of those challenges is a shortage of helium, the lighter-than-air gas that creates the buoyancy. If airships ever do become a viable means of transport, the availability of — or alternative to — helium will have to be addressed. Prentice has been tilting at the airship windmill for 10 years now. He regularly expresses his frustration about how long it is taking, but is becoming philosophical about that. On a shoestring budget, he and his design partner, Dale George, have established a small development shop in a canvas hut at the end of an unused runway at St. Andrew’s Airport. The shop, funded almost entirely out of their own pockets, just unveiled a solar system to power the operation, which is off the hydro grid. “That gas-powered generator was so noisy, I’d like to throw it in the lake,” Prentice said. But in addition to providing heat and light for the operation, the generation of solar power stored in a rack of batteries could lead to some other interesting developments specific to the airship business. 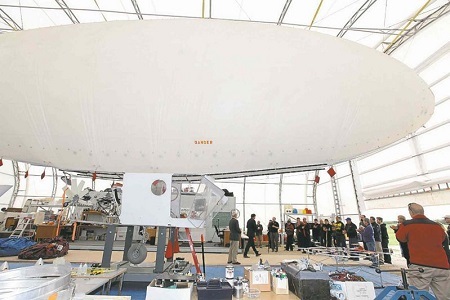 Prentice is already thinking about the possibility of using the excess electricity generated from BASI’s solar panels to produce hydrogen, which could be used both as fuel for the engines on the airships and as a possible replacement for helium. BASI is already working with a company out of Ontario that has an innovative new design for a hydrolyzer. Prentice is a highly regarded academic, and his work in the field is known around the world. His modest announcement of the addition of solar power to his green operations had enough credibility to attract two local federal politicians — MPs James Bezan and Lawrence Toet — in what was far from a high-profile event. Hydrogen, which is highly flammable, has been prohibited for use in airships since the late 1930s after a number of accidents, including the spectacular crash of the Hindenburg in 1937. Prentice understands the significant safety issues and the general aversion to the use of hydrogen. Among other things, BASI is developing unmanned versions of its airship design, which might provide another reason to overcome the fear of hydrogen. Prentice will be the first to tell you airships are a long way from becoming a commercial realty. But the reasonableness of the concept won’t go away. This entry was posted in Airships, Unmanned airships and tagged airship, Barry Prentice, BASI, Buoyant Aircraft Systems International, Helium, hydrogen, University of Manitoba, unmanned airship. Bookmark the permalink.